Old Tavern, Main Street, Myersville, Circa 1905. This building was constructed in 1796 and functioned as a public house. Early merchant Joseph Brown would later build his store beside it. This picture was taken after the trolley came to Myersville in the 1898. The old tavern was demolished sometime after 1905, presumably by John Caleb Leatherman, who built a new house (203 Main Street) on the site that was completed in 1909. 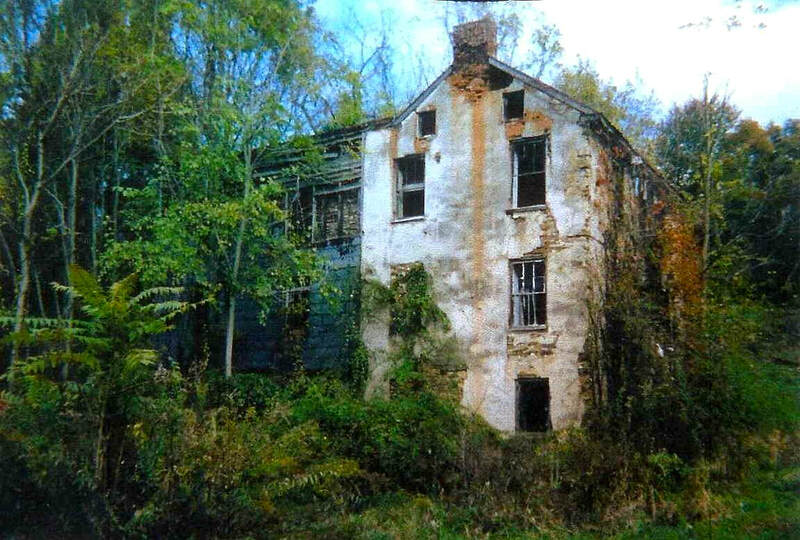 During the Civil War, the structure was the home of Maryland Militia Captain Aaron Poffenberger. The Valley Register, 6 September, 1861, reported, "About noon on Monday last a detachment of 30 men from companies B and F of the 4th Connecticut Regiment passed through this place from Myersville in this valley, having in charge a number of State Rifles, found in the possession of Capt. Aaron Poffenberger, of that village, whom they had previously placed under arrest. The information against Captain Poffenberger was that he had, by handbill, recently called in these riffles from the possession of persons belonging to a company he commanded from 1845 to 1848, and that he was in the habit of drilling a number of his partisan friends in the use of this deadly arm. He denied that he was a Secession sympathizer and declared himself a Union man. He was then asked to surrender then and promptly complied by giving up 4 stand; whereupon he he was released from arrest. The rifles have been given one of the companies of the 'Home Brigade' for guard duty." Structures and Homes within Myersville in 1873. This plat is also from Titus Atlas of Frederick County. On it can be seen Poffeburger's Tavern ("A. Poffinberger") with the Joseph Brown store beside it; the home of businessman and Maryland State Representative Upton Burhman; the carriage shop of John T. Hildebrandt ("Wg. Sh.") that would soon catch fire and also burn St. Paul's Lutheran Church next door; the United Brethren Church parsonage ("U.B. 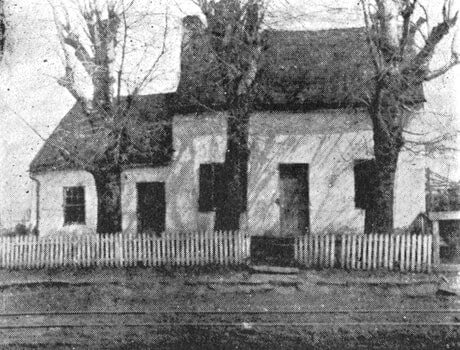 Parsonage"), the home of the widowed Catharine Shank Linebaugh ("Mrs. Linebaugh") whose husband, wagonmaker and wheelwright Jonathan Linebaugh, died in 1864; and others that will be identified and added to this caption soon. 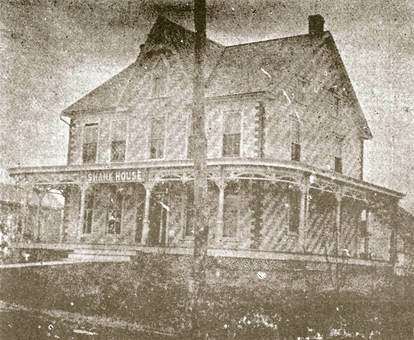 Linebaugh Home, Main Street, Myersville, Circa 1890. This house, today numbered 506 Main Street, was lived in for many years by wagonmaker and farmer Jonathan Linebaugh (1807-1864). After his death, his wife Catherine Shank Linebaugh (1813-1871) remained in the home until her own passing. Afterward, a number of family members emigrated to Ohio, where their descendants remain today. Flook, Gaver, et al Private Bank, Main Street, Myersville, Circa 1890. The owners and officers of the bank as: Cyrus F. Flook, president; George D. Gaver, vice president; John C. Leatherman, treasurer; Dr. A. J Smith, secretary; Joshua Summers, assistant cashier; and C. Upton Grossnickle. When the bank moved to a brick building constructed next door, this became the Farmers Mutual Exchange. Both it and the bank burned down in January 1919. 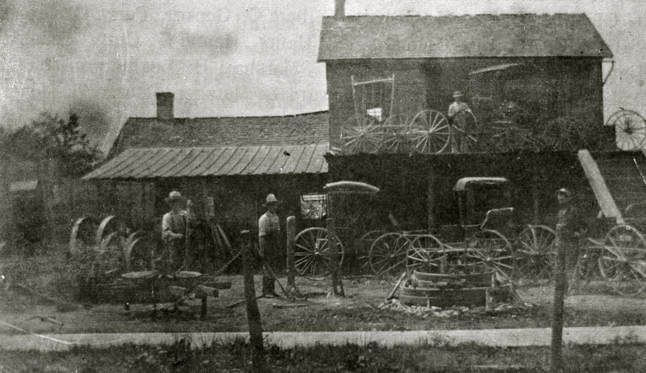 Raymer's Carriage Shop, Circa 1895. Left to right: Simon Raymer, Charles J. Bittle, John R. Langdon, and Homer Raymer. First operated by John Hildebrand as the Myersville Carriage Factory, later it would be run by Charles Bittle, Edward Bittle, John R. Langdon, and Homer Raymer. 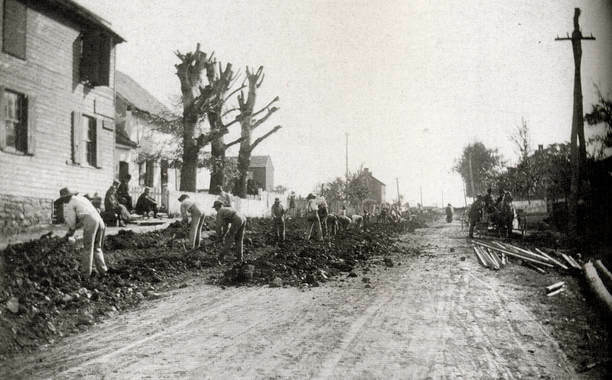 Trolley Tracks Being Laid in Front of Joseph Brown's Store and the Old Tavern, 1898. The Poffinberger Tavern is visible just past the store. Courtesy Frederick County Historical Society. Offering Card from St. Paul's Lutheran Church, 1899. This card was signed by town merchant George Waters Bittle. Office of the Monitor, 414 Main Street, Myersville, Circa Late 1800s. The Monitor was the town's newspaper in the late 1890s. It was believed that its archives were lost in a fire that consumed this building, but now it seems possible that original building is yet a part of the current home at that address and that the Monitor's office was moved to the business area of Main Street. 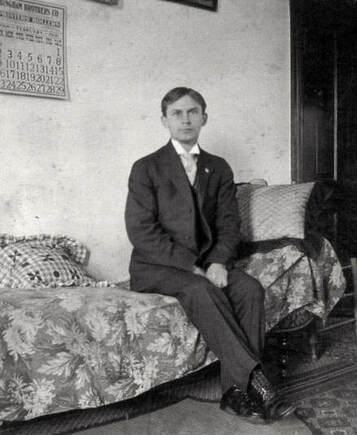 Right: Ira C. Moser, Owner and Publisher of the Myersville Monitor, Circa 1905. Moser, who bought the paper at age 20, was a great promoter of Myersville, but he met with some hostility from townspeople and was plagued by robberies and physical attacks. He wrote The History of Myersville in 1905 and later moved to Boonsboro. Courtesy St. Paul's Lutheran Church. Left: Baltimore Sun, 12 April, 1907. Myersville's Muddy Main Street Looking South, Circa 1900. Courtesy Charles Martin family. 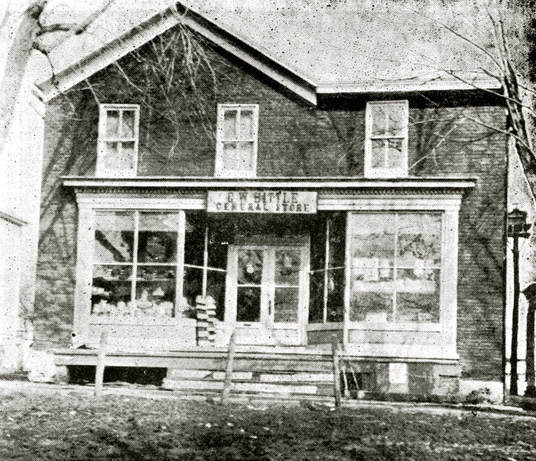 Right: George Waters Bittle General Store, Main Street, Myersville, Circa 1900. Bittle was shot three times in front of this building in the summer of 1903 whilst trying to stop a robber he identified as George Koogle, son of Civil War Medal of Honor winner Jacob Koogle. Bittle survived and Koogle was prosecuted, but a hung jury resulted and the case was never retried. The Koogle family relocated to Hagerstown. Top Left: Baltimore Sun, 18 December, 1903. Bottom Left: The site of the August 1903 shooting. Bottom Right: A receipt from the G. W. Bittle Store. 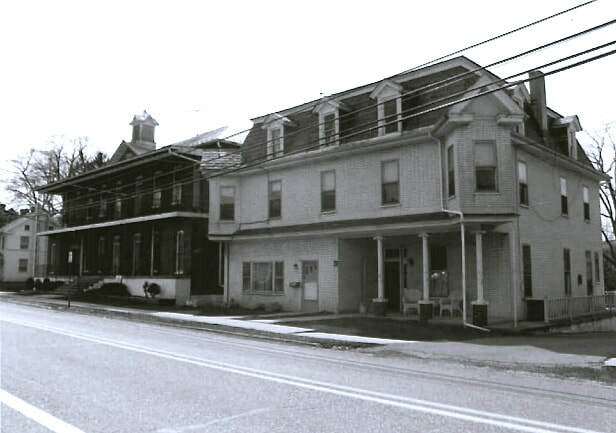 Shank House Hotel, 200 Main Street, Myersville, Circa 1905. The town's only hotel is now a private home. The porch's decorative wood trim survived until a 2016 renovation. 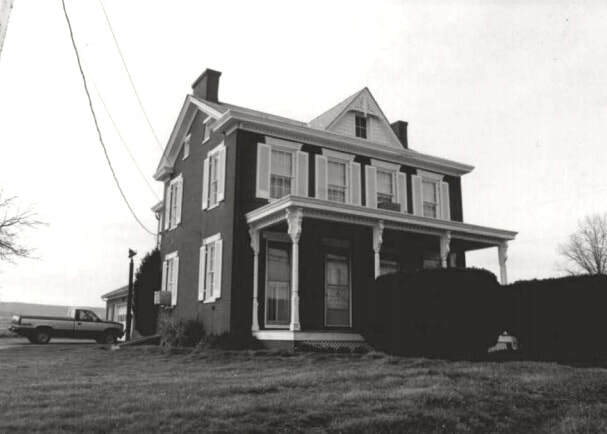 The 1992 Maryland Historical Trust's survey of the town notes, "The two-story frame dwelling built about 1882 has a five-bay east elevation with a center entrance and a one-story porch which wraps around three sides of the house. A cross gable with a pointed arch gable winlow with 2/2 sash dominates the east elevation. 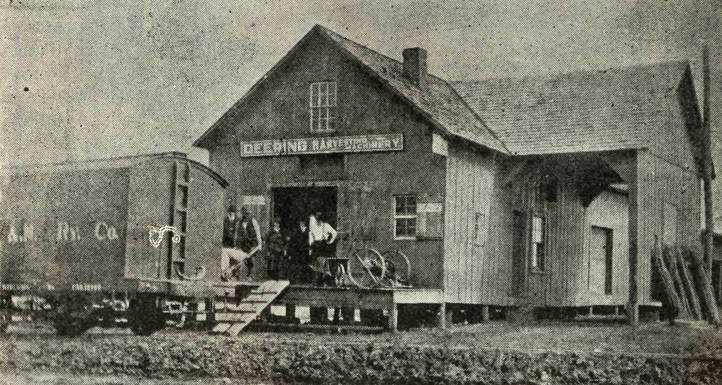 The vinyl siding probably covers rusticated wood siding as shown in a photo in Moser's 1905 History of Myersville. The porch has scroll-sawn trim and turned columns which are also seen in the 1905 view. The roof is composition. The sash is 2/2 in arched frames. The Shank House was a hotel and boarding house from at least the 1890s to the 1920s, when the interurban railway connections appealed to summer visitors from the nearby cities. The photo in the 1905 history indicates the rusticated siding was painted in alternating colors, giving a diagonal striped appearance to the exterior. The quoins were painted a darker color. " Myersville Savings Bank Interior, Circa 1905. Myersville Post Office, Circa 1905. The house at 310 Main Street was also the residence of Melvin Shepley and his wife Bessie. 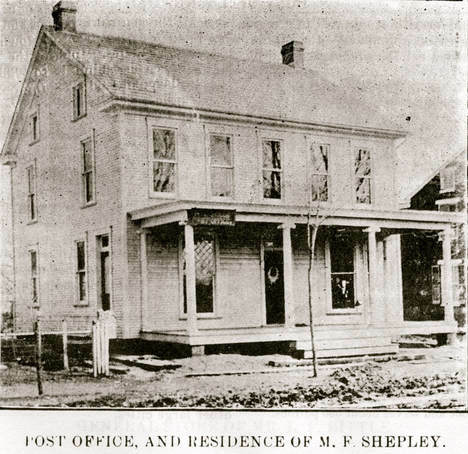 Shepley was appointed as postmaster in April 1903. Main Street, Myersville, Circa 1905. 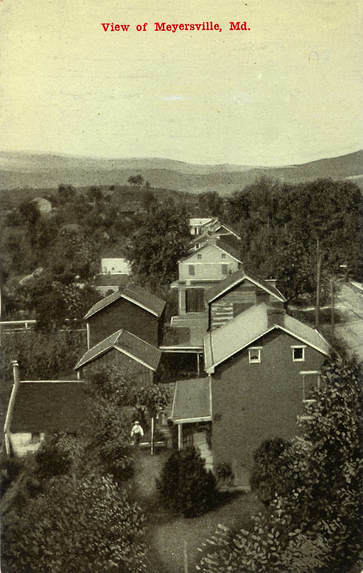 This bird's-eye view photograph, looking south, was taken soon after the electric railway began spurring development in Myersville in the early 1900s. The roofs of Rhoe and Bland's Creamery are visible opposite the Lawson Bittle house and store. The long-running mercantile establishment of Joseph Brown can also be seen -- it is the second house beyond the creamery. Also in this image, three women stroll the sidewalk under the sign for The Farmers Mutual Exchange and toward the bank at the intersection Main Street and Route 17. These buildings were destroyed by the fire of January 1919. Trolley Conductors, Myersville, Circa 1905. 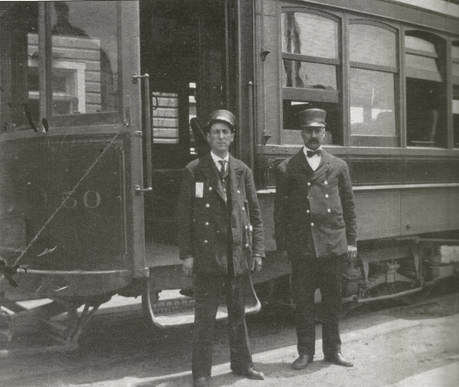 The conductor on the left is Roy Cyrus Garnand who later worked for the Washington, D.C., trolley company. Courtesy Bittle family. Warehouse of Elmer A. Young, Main Street, Myersville, Circa 1905. In 1904, Young purchased the warehouse formerly owned by Toms & Bittle to deal in grain, coal, wood, hay, and machinery. Hildebrand House, Main Street, Myersville, Postcard, 26 June, 1908. Prosperous carriage maker John T. Hildebrand (1829-1923) built this fine home for himself and his wife, Sophia Brown (1844–1911), the eldest daughter of Joseph Brown. The house still stands today. The postcard is addressed to "N. B. Weaver, Ellett, Montgomery Co., Va." The message reads, “Mrs. Weaver, Douglas rec’d your lovely card & was delighted with it, so I thought I would like to send you one this time. We never have had any with reading one like you sent him and was pleased with it. Mama is anxiously looking for a letter from you. She thinks you have forgotten her. Did you get hers? Please answer soon. Mama says write soon. I would like to see you. Lovingly, Edward. Douglas will answer yours when I hear from you. He was pleased very much. From Edward McDonough. By by. How is Miss Mary? Tell her to write.” The card was sent on behalf of George David Routzahn's (1842–1917) grandson, Bernard Douglas McDonough (1901–1918), by the boy's father John Edward McDonough, Sr. (1864–1923). ​Courtesy Ann Longmore-Etheridge. Myersville High School, Postcard, 15 February, 1908. The high school, which sits at the intersection of Main Street and Monument Road, saw later use as, amongst other things, a shirt and pajama factory. Today, it is an apartment building. The message on the reverse reads: “Miss Bessie Williams, Stephens City, VA, I received your card. We have had powerful rain here and have had heavy snow just before and it is bad to get around. But Mr. Sir holding his meeting in Myersville and I have not missed any at all. [Con't on front]Love to you and mother. High School Myersville. Miss. [?] Stanton.” Courtesy Ann Longmore-Etheridge. United Brethren Church, Myersville, Postcard, Circa 1910. This postcard dates to between 1910-1915. It was addressed to Mrs. Jacob Koogle of Hagerstown, wife of Civil War hero, but was not posted. Close examination of the image does not show that stained glass windows have been added, thus dating the image before the 1916 remodeling when ornate windows that still exist today were put in place. The fence and hitching posts reported to have been added during the 1905 remodeling appear in the image. The identity of the man, whose picture is not part of the postcard, but cut out and pasted onto it, is unknown. He is presumably the reverend at that time. If anyone can identify him, please contact us. Courtesy Ann Longmore-Etheridge. Myersville Savings Bank, Main Street, Myersville, Circa 1910. Houses Along Main Street, Myersville, Unused Postcard, Circa 1910. This was taken from the belfry of St. Paul's Lutheran Church. Courtesy Ann Longmore-Etheridge. 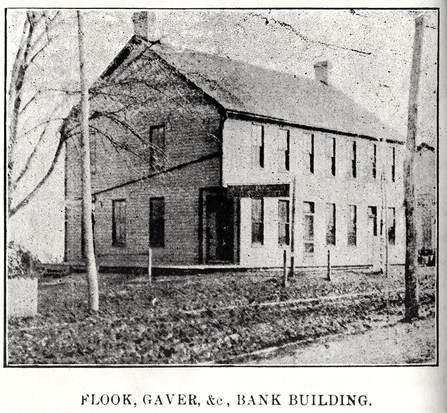 Flook, Gaver, Leatherman, Summers, and Grossnickle Bank, Corner of Route 17 and Main Street, Circa 1910. This bank burned to the ground in January 1919 and was replaced by the bank building still standing at the site today. Postcard to Nellie Pettingall, April 1911. 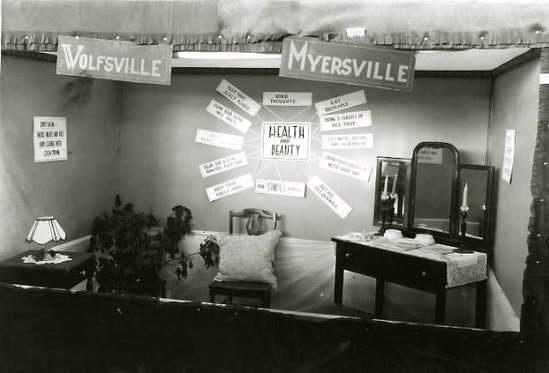 The unsigned card reads, ​"How is old Myersville these cold days. She looks good to me. You ought to be here now. Skating is just fine. Oh you Feb 22nd. I wonder where I will spend it this year. Best Regards. 4-12-11." Nellie Pettingall lived on Main Street in 1911. Born in 1888, she was the daughter of Samuel H. Pettingall (1848-1929) and Amanda C. Poffenberger (1850-1931). She married steel mill worker W. Clyde Raines, who may well have been the author of this postcard. She was a graduate of Hood College and taught in Frederick County schools for a number of years. Nellie and Clyde had one son, William P. Raines. Nellie died in Pittsburgh, Pennsylvania, 18 Feb 1970. Clyde died in 1976. Both are buried at Mt. Zion Church Cemetery. Courtesy Ann Longmore-Etheridge. Main Street, Myersville, Postcard, Postmarked May 8, 1911. 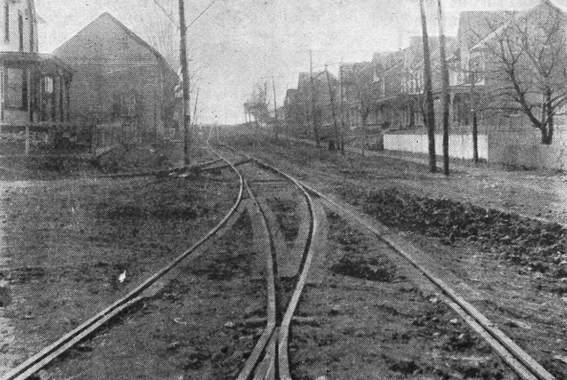 This image shows the trolley tracks and the fine shade trees lining Main Street -- a few of which still survive today. Courtesy Ann Longmore-Etheridge. 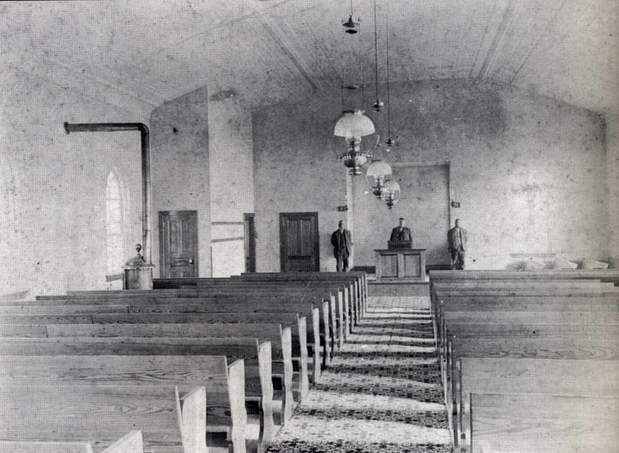 Interior, Myersville Church of the Brethren, Circa 1915. ​Courtesy Debbie Wilson. 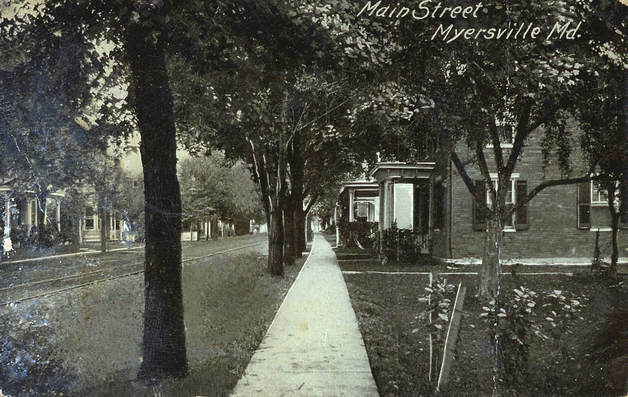 Main Street, Myersville, Postcard, June 1918. This postcard was mailed from within the town to another Myersville resident. The reverse reads: "To: Mrs. Charles Forrest, Myersville, Md. Dear Sister, I heard the children have the measles. I hope they are over them by this time. Mary wrote to me and told me she wants us all to come down Sun. We expect to go as far as we know. Be sure and go too. Try to meet us at Tabor Station at 9 o'clock or not later than half past at the old time. We will try to be there. Goodbye from Lelah." Courtesy Ann Longmore-Etheridge. 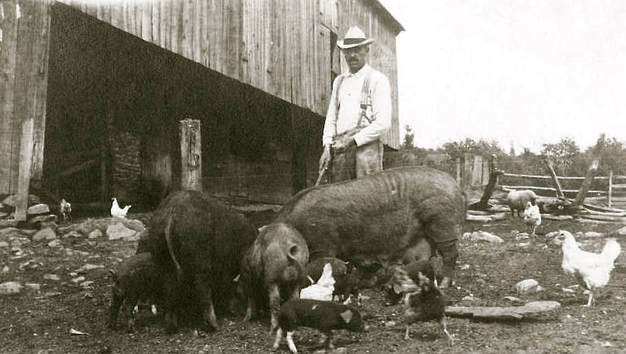 Myersville Farmer and Newspaper Correspondent Charles O. Easterday with His Swine Breeders by His Barn, 1919. Courtesy Frederick County Extension Office Photographs, Frederick County Public Libraries. Myersville Team Baseball Players, 1917. Shown are team members Charlie Hauver, Foster Bittle, Russell Grossnickle, Clifford Bittle, Ed Hauver, Upton Harp, Russel Wachtel, Ord Stroop, Leonard Beachley, and Omer Dubel. United Brethren Rally Day Postcard, October 1917. This postcard was sent to Helen Keller and family, Myersville, MD, on 30 October, 1917. Rally Days are held as a new start or a renewed effort in involving children, youth, and adults in Sunday School. Courtesy Ann Longmore-Etheridge. Myersville Rural Mail Delivery, 1918. The postman out on this snowy day was John M. Grossnickle, who also carried the title of town poet. Courtesy Kathy Falkenstein. ​St. 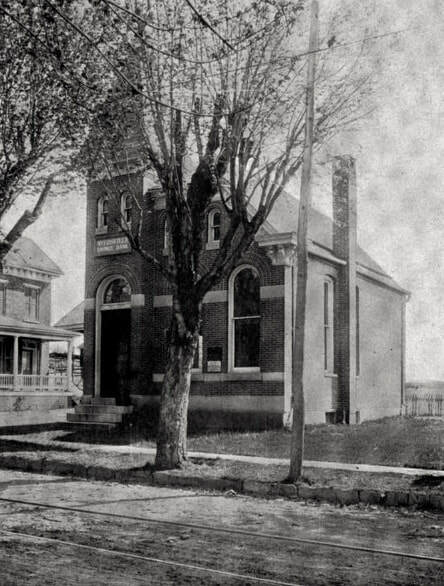 Paul's Lutheran Church, Main Street, Myersville, Circa 1900. 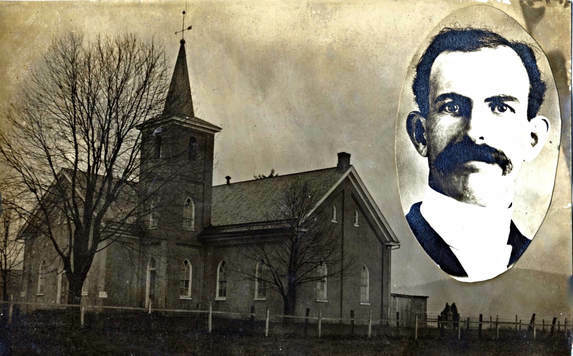 Genealogist and Historian Bob Fout writes, "One night in the Spring of 1854, Messrs. Joseph Brown, William Metzger and James S. Gladhill, then members of St. John’s Lutheran congregation at Church Hill, met together to discuss the advisability of erecting a Lutheran Church and organization in nearby Myersville. Rev. Christian Startzman, then pastor at St. John’s, was consulted, and gave the project a hearty approval. It was then determined that a church be built and accordingly, a lot – the one on which the present church stands – was purchased and a building committee was appointed. The work on St. Paul’s Lutheran Church was commenced and in the Fall of 1855, this first Lutheran Church in Myersville was dedicated. The total cost was $3,100. However, in April 1872, a fire destroyed the church. In 1874, St. Paul’s Lutheran Church was rebuilt and rededicated at a cost of $7,000." ​Courtesy Ann Longmore-Etheridge. Bittle Farm Near Myersville, Circa 1900. Bittle Farm House Near Myersville, Circa 1900. Myersville Baseball Team Players Russell Wachtel and Russell Grossnickle in Front of the Lawson Bittle Store, Main Street, Myersville, Circa 1918. ​We know that this picture predates January 1919, when the buildings on the right burned to the ground. Courtesy Debbie Wilson. 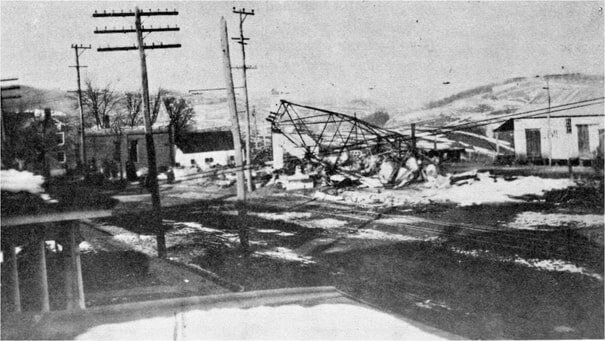 Fire Aftermath on Main Street, Myersville, January, 1919. On the fourth of January, a devastating fire destroyed the trolley depot, bank, the Farmers Mutual Exchange, and nearby residences. 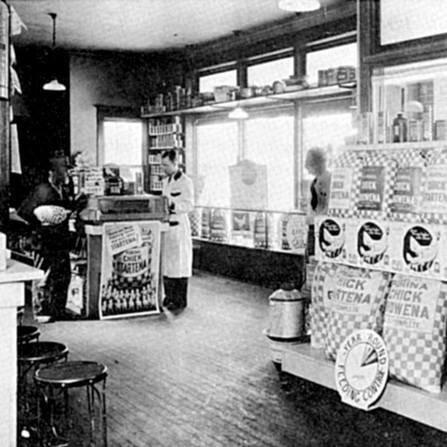 This image was probably taken from the second floor of the Lawson Bittle store. Left: Unidentified Proud Myersvillians with Their Automobile, Circa 1920. Right: Promo Card of Car Salesmen Brandenburg & Harne, 1925. The Myersville Band, Circa 1925. During the 1920s, 1930s, and early 1940s, this band flourished, playing crowded open-air concerts on Saturday nights. Postcard to C. A. Ruppersberger, Jr., Postmarked 6 january, 1923. The reverse reads: Dear Sweet Heart, do what this verse says as soon as possible. Grand Mother." 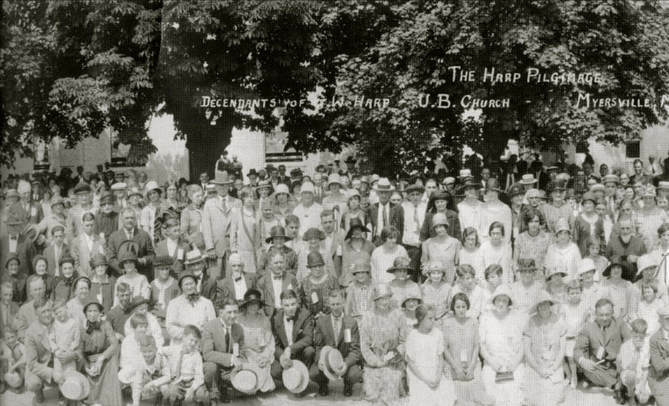 Harp Family Reunion, July 1926. This wonderful photo was taken in Main Street, Myersville, outside what is today Mt. Zion United Methodist Church, then Myersville United Brethren Church. Included are the trolley, the church parsonage, and dozens of Myersvillians. If you recognize anyone in this picture, please contact us. Courtesy Summers family. Harp Family Reunion, July 1926. More than 800 of George S. Harp's (1765-1844) descendants attended. Courtesy Summers family. Yearbook for the Woman's Club of Myersville, 1926-1927. "Club Colors: Yellow and White; Club Flower: Daisy; Motto: Labor Conquers Everything. Officers: President -- Mrs. D. Edgar Bittle; Vice President -- Mrs. W. E. Hauver; Secretary -- Miss Mary Muck; Treasurer -- -Miss Effie J. Dean." 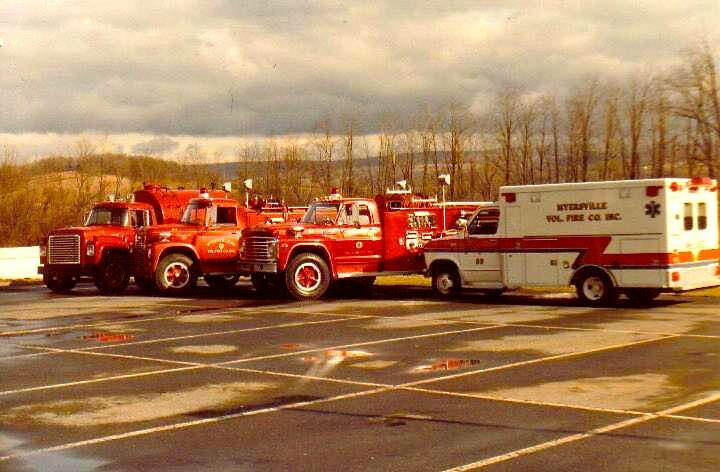 Courtesy Middletown Valley Historical Society. Motorcars on Main Street, Myersville, Circa 1928. 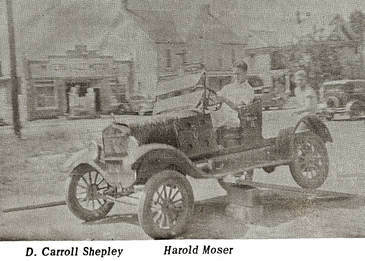 Daniel Carrol Shepley (1908-1961) and Harold Moser (1904-1997) appear up to shenanigans with what was then a ten- to fifteen-year-old auto. Myersville Motor Company and Summers Garage, Circa 1930. This picture was taken decades before the building's reincarnations as Ross General Store, a chocolate shop, and J.B. Seafood. Courtesy Summers family. Myersville Motor Company and Summers Garage (Left) and the Trolley Parked by the Trolley Shed (Right), Circa 1930. Courtesy Summers family. Trolley at the Myersville Station, Circa 1930. Behind the parked trolley is the colonnaded front porch and entrance to People's Supply Company. Trolley at the Myersville Station, Circa 1930. A trolley as it makes its way through Myersville in front of the People's Supply. The doorway visible near the trolley is sitting leads to the Trolley Waiting Station. The young boy checking to see whether the trolley can clear the automobile is reportedly a young Bob Falkenstein, whose parents owned the and operated the store. The trolley waiting station is now marked with a plaque. 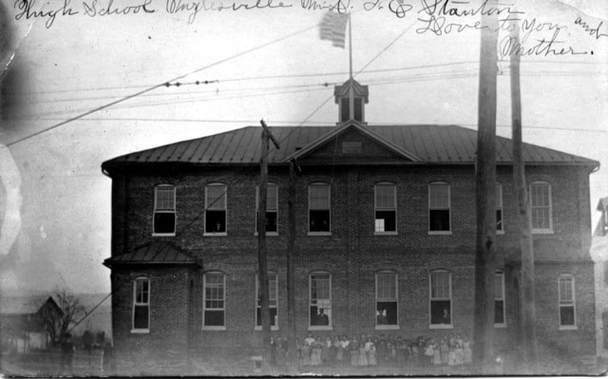 Myersville School, Harp Place, Circa 1928. This school was built in 1927 and later burned down. Courtesy Charles S. Martin family. WPA Myersville Reservoir Project, 1935. The reverse of this image reads: "Works Progress Administration of Maryland, Division of Operations. Myersville, Frederick County. Reconstruction of the city water system. Showing the completed reservoir." Courtesy Works Progress Administration of Maryland, Enoch Pratt Free Library. Myersville School Teachers, Circa 1938. 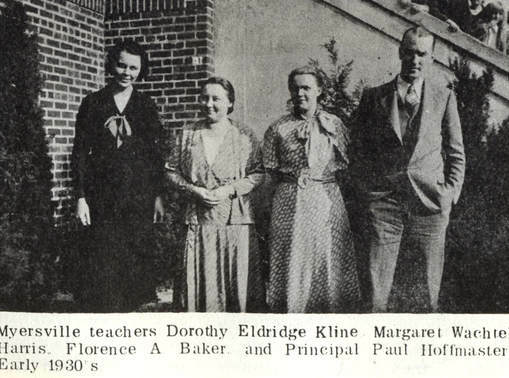 Left to Right: Dorothy Eldridge Kline, Margaret Wachter Harris, Florence A. Baker, and Paul Hoffmaster. Some of their students are just visible peeking over the balcony on the right. 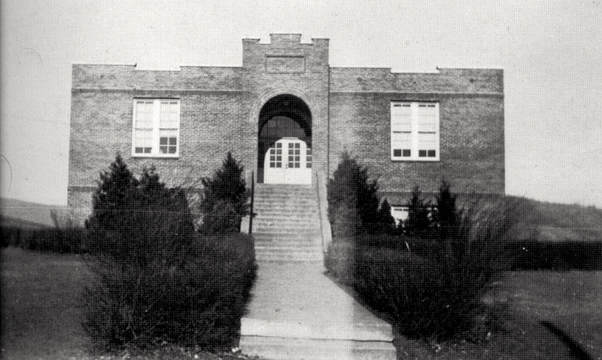 Myersville School, 1941. This building replaced the previous school, which caught fire. It served the community for many years as an elementary school and then as the Myersville town hall and offices. 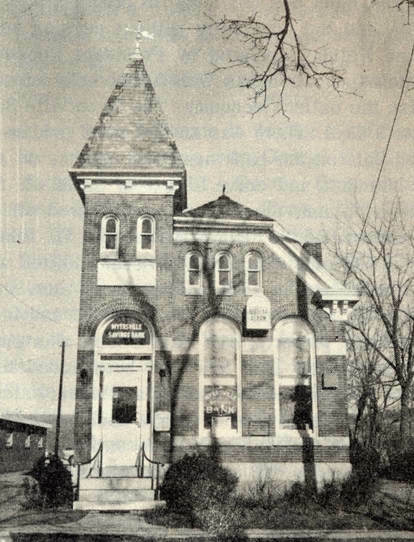 It was demolished in the 2010s and is now the site of Myersville's library. 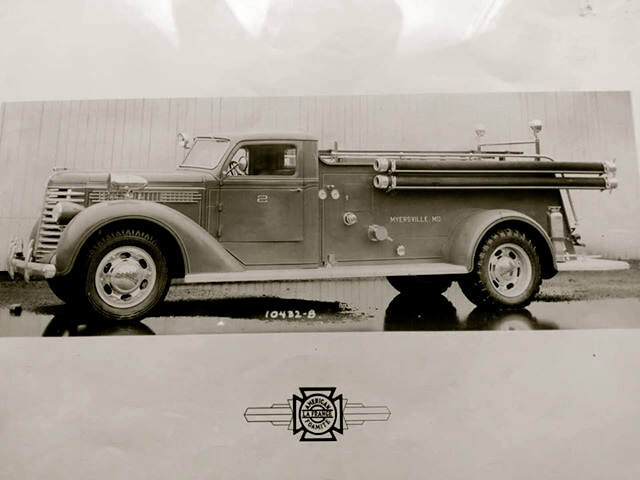 Myersville Fire Department's 1916 American La France Pumper, 1941. 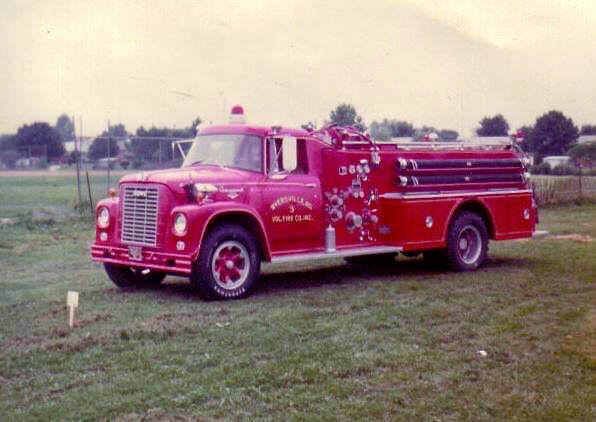 This picture appears to have been taken for the retirement of the pumper, as the sign above it reads, "I'm Headin' for the Last Round-Up." 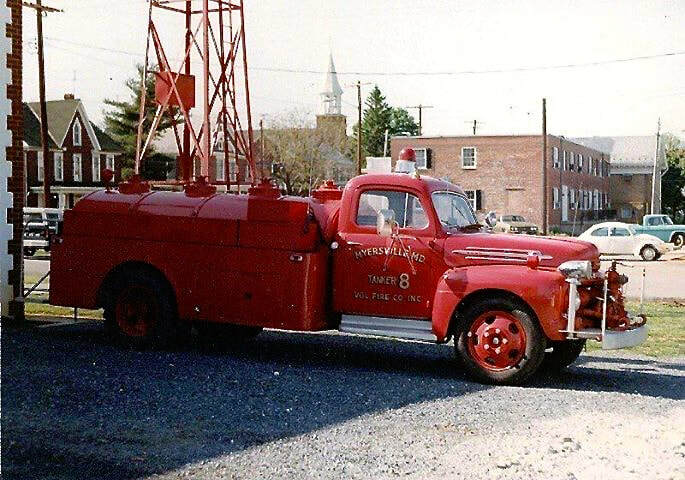 Pumper Truck Parked at Myersville's Original Fire Station, Circa 1940s. 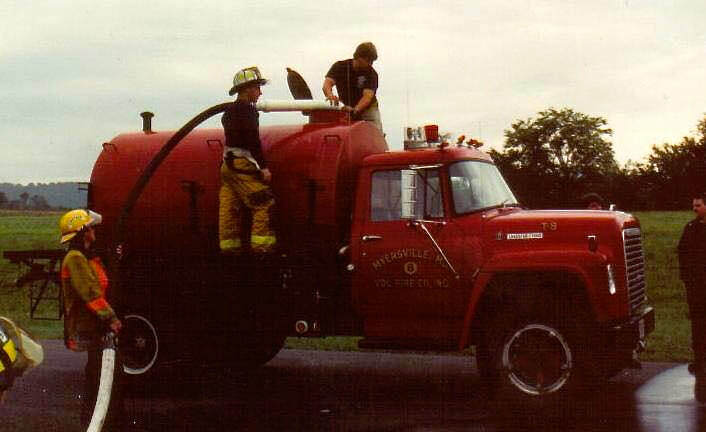 This pumper was the first unit placed in service at the Wolfsville Volunteer Fire Company when it was a substation to Myersville. The first fire station was attached to the rear of the Town Hall and post office at the corner of Main Street and Route 17. Before the Great Depression, the building had been the Banking House of Flook, Gaver, Leatherman, Summers, Grossnickle, and Company. 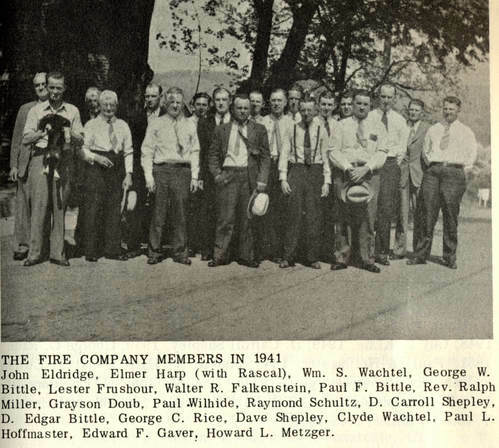 Myersville Fire Company Members, 1941. Left to right: John Eldridge, Elmer Harp, William S. Wachtel, George W. Bitte, Lester Frushour, Walter R. Falkenstein, Paul F. Bittle, Rev. Ralph Miller, Grayson Doub, Paul Wilhide, Raymond Schultz, D. Carroll Shepley, D. Edger Bittle, George C. Rice, Dave Shepley, Clyde Wachtel, Paul L. Hoffmaster, Edward F. Gaver, and Howard L. Metzger. Hagerstown & Frederick Railway Trolley 160 on Rudy’s Hollow Trestle Bridge Near Myersville, May 1941. Potomac Edison Woody Station Wagon Drops Off Passengers in Myersville, 1947. This was taken at the intersection of Route 17 and Main Street in Myersville. The driver wears a hat with an H&F RR badge. The Trolley Station was a block from this intersection. The road signs point North toward Ellerton, Middlepoint -- which is now no more that a few houses and a garage -- and Wolfsville. Presumably, this station wagon was a part of the P&E /H&F RR system, used to transport riders to and from stations. Photo and information courtesy John A. Kinnaird. An Aerial View of Main Street, Myersville, 1956. Myersville Sewing Circle, 1958. ​Pictured (front row, L to R): Martha Bullivant, Louyse Falkenstein, and Nancy Summers. (Back row L to R): Elizabeth Johnson, Alice Schigliano, Nellie Doub, Nellie Cline, Edna Grossnickle, and Eleanor Bittle. Myersville Savings Bank, Main Street, Myersville, 1960. Left: Cover, Peoples Supply Company, Myersville, Circa 1960. Peoples Supply also ran gas pumps. This matchbook promotes Amoco products sold by the store. Courtesy Mark Etheridge. Right: Interior, People's Supply Company, Circa 1960. The store was owned by Walter Falkenstein. It is now part of a private apartment building next to Trolley Park. Gathering of the Wilhide Family Outside St. Paul's Lutheran, Circa 1963. John Emmert Shepley is in the center, wearing a bow tie. Myersville Volunteer Fire Company's Station Under Construction on Main Street, Myersville, Circa 1969. 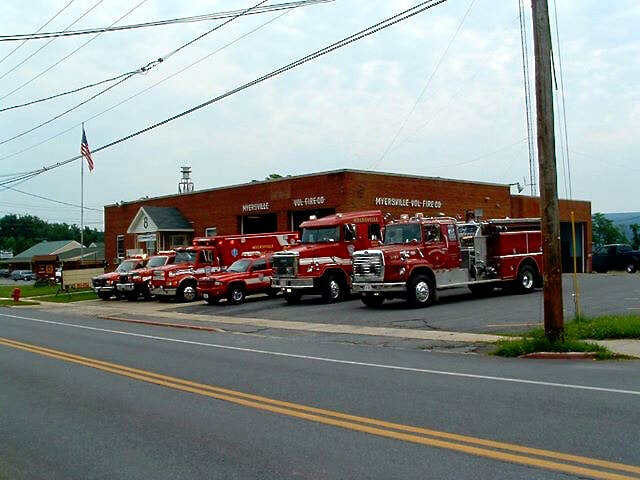 This was the second home of the fire company. Across the street, on the right, is the intersection of Main Street and Monument Road, and the former Myersville School is visible, yet without its balconies. 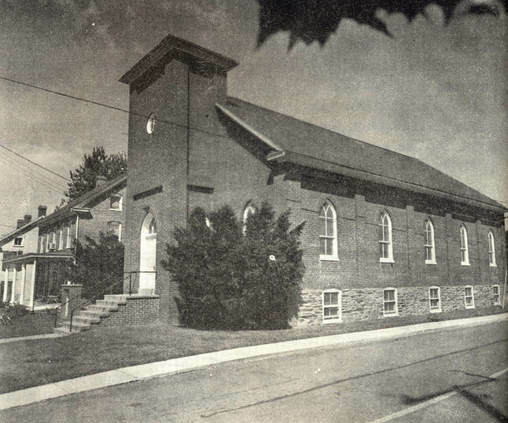 Myersville Church of the Brethren, Circa 1970. Robert Ridgley donated the land and traveled to the town of Schwartzenau, a borough of Bad Berleburg in today’s North Rhine-Westphalia, to purchase a granite block cornerstone for the church, which was then under construction. The Brethren originated in Schwartzenau so the cornerstone carried great significance to the congregation at home. 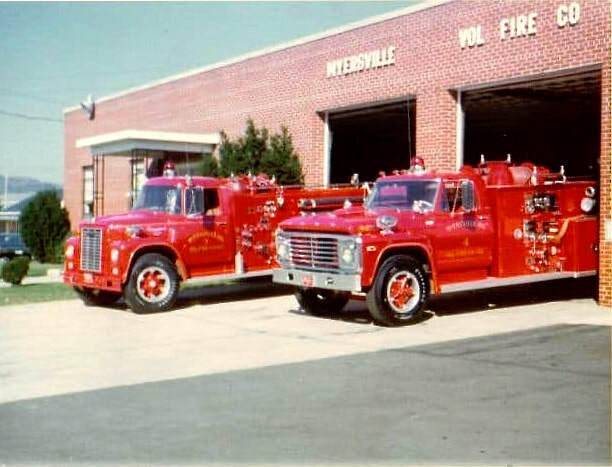 Myersville Volunteer Fire Company, Main Street, Myersville, in the early 1970s. Color images Courtesy Brian Grossnickle. 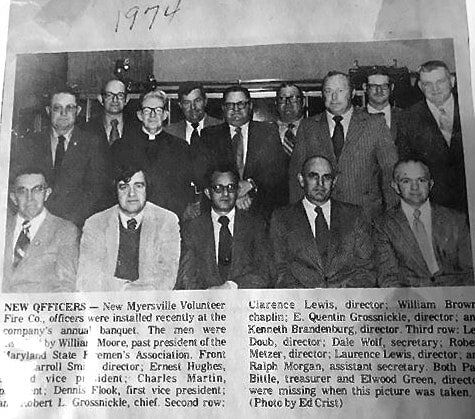 Myersville Volunteer Fire Company Officers, 1974. The names include Ernest Hughes, Charles Martin, Dennis Flook, Robert L. Grossnickle, Clarence Lewis, William Brown, E. Quentin Grossnickle, Kenneth Brandenburg, L. Doub, Dale Wolf, Robert Metzer, Laurence Lewis, and Ralph Morgan. Courtesy Brian Grossnickle. 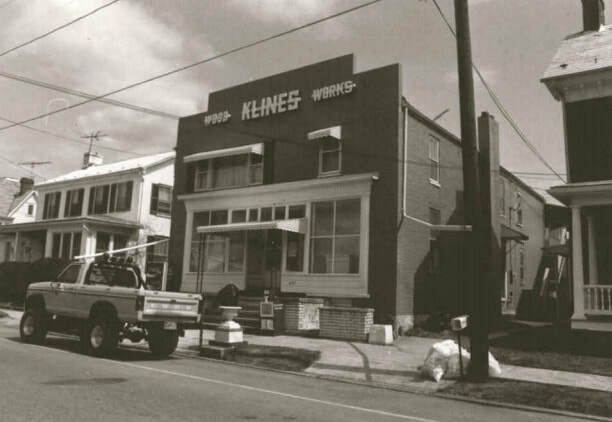 John W. Kinnaman Harness and Shoe Shop, 418 Main Street, Myersville, 1992. "This one-story shop dating from the last quarter of the 19th century has been expanded on the west elevation to two levels and converted to residential use. It retains much of its original appearance on the east elevation, with a two-bay elevation under a small gabled porch roof and a single door and 2/2 window. On the south elevation, a modern shed extension joins the rear expansion. The roof is standing seam metal and the concrete-block chimney is located at the west gable end. This is the only example of the small shop among the commercial buildings of the period." From the Maryland Historical Trust's survey of the town. 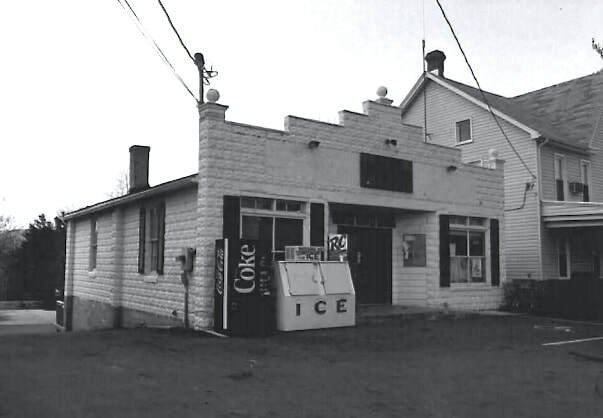 Ross General Store, Main Street, Myersville, 1992. For a number of years, this little store, formerly the Myersville Motor Company, was the heart of town. This photo comes from the Maryland Historical Trust's survey of the town. Wendell A. Smith Farm, Main Street, Myersville, 1992. The town's first log cabin, which may have dated to as early as 1742, is said to have stood ten feet north of this farmhouse. This photo comes from the Maryland Historical Trust's survey of the town. Former Myersville School and Lawson F. Bittle General Store, Main Street, Myersville, 1992. This photo comes from the Maryland Historical Trust's survey of the town. 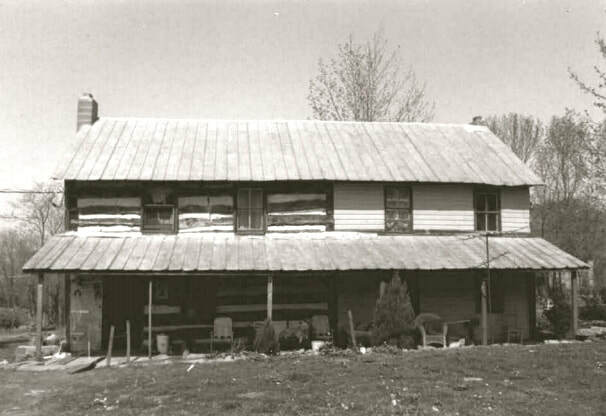 William Green Farmstead, Rum Spring Road, Myersville, 1992. This photo is from a Maryland National Trust survey. The William Green farm is centered on a two-section log and frame dwelling built about 1800 and added to in 1890-1900, with two log outbuildings possibly contemporary with the log part of the dwelling, a rebuilt frame and stone springhouse, and a frame bank barn of about 1850 with an extension of about 1900, a wagon shed, and several frame chicken houses of about the same period. Smith-Bowlus House, Monument Road, Myersville, Circa 1892. It is a two-story frame dwelling with German siding and a four-bay main elevation with double entrances. Associated with the house is a frame summer kitchen with German siding, a frame chicken house, and a small frame barn. Built between 1862 and 1865 by John Smith, it was sold to Joseph Bowlus in 1865. In the 1990s and early 2000s, it was a daycare center and private home. It was surveyed by the Maryland National Trust. Charles Donald Easterday (1934-2016) with Trolley 150, Circa 2000. His obituary noted, "He was active in the preservation and restoration of historic buildings. He was a member of the Frederick County Tourism and participated in the Frederick County Museum by Candlelight, hosting tours of the historic structures on the family homestead. He acquired the Hagerstown-Frederick (H&F) Trolley 150 in 1992 and restored the trolley shortly thereafter. In 1994, he established and hosted the Myersville Trolley Festival and attracted trolley enthusiasts from all over the country. This festival was built around his love of the H&F trolley that ran through the local area from 1898 until 1956. Tens of thousands of trolley enthusiasts attended 18 Trolley Festivals between 1994 and 2012." Courtesy Ann Longmore-Etheridge. Top Left and Bottom Right: The Leatherman farmhouse on Brethren Church Road, Myersville. 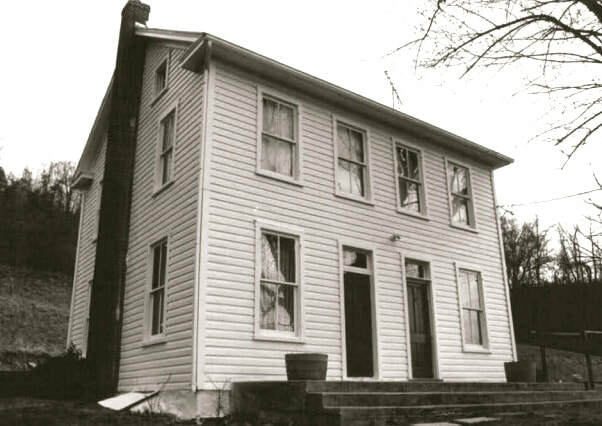 The house was built in about 1850 by Elder George Leatherman. The house was abandoned circa 1945, with its barn burning down in 2001. Photos courtesy Stanley Leatherman. Top Right: Amongst those who called this house home were John Caleb Leatherman (1852-1952), George Carlton Leatherman (1858-1955), David O. Leatherman (1857-1922), Charles Theodore Leatherman (1855-1946), Julia Malissa Leatherman Harshman (1862-1958), Clara Rebecca Leatherman Grossnickle (1851-1963), Sarah Catherine Leatherman Derr (1856-1956). Bottom Left: George Leatherman (1827-1907). 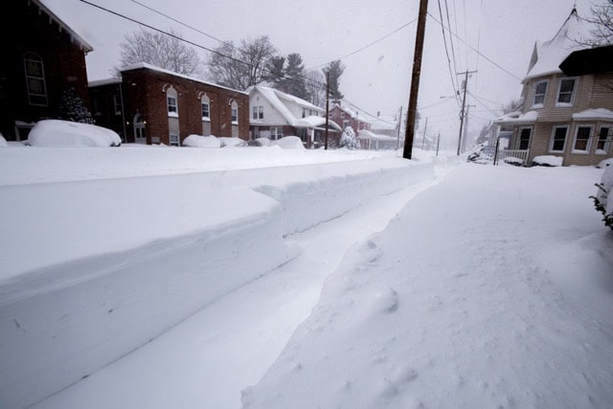 Main Street, Myersville, "Snowpocalypse" of January 2010.